VLC is the big name when people mention to media player. 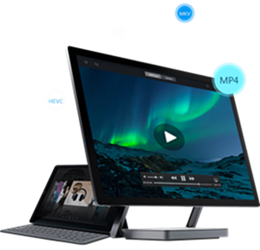 It's free but powered with the ability to support virtually all video formats as well as DVD, CD, VCD without additional codecs installed. More than you might think, it can do more creative things than playing media files, one of which is converting video. In this article, we give full focus on VLC video converter showing what it can do and how to use it. • Convert videos to MP4 (H.264/HEVC), MKV, AVI, MOV, FLV, WebM, MTS, VOB, iPhone, iPad, Apple TV, Samsung, Huawei, Xbox, PS3/4 etc, with high quality. • Compress 4K/HD videos for uploading to YouTube, Facebook, Instagram, Twitter or sending via Email correctly. • Fully speed up video transcoding thanks to the utilization of hardware acceleration with the support of GPU (Intel, NVIDIA, AMD) encoding and decoding. What Is VLC Video Converter? VLC can work as a video converter when it comes to transcode a video. It offers a "Convert/Save" option allowing users to save a video file in another format or extract audio from an input. It accepts a wide range of inputs and offers limited but widely used output codecs, such as H.265, H.264, MPEG4, MPEG-2 and so on. It also presets SD/HD profiles for iPhone, iPod, Android and YouTube helping transcode a video for completely fitting playback or uploading requirements. If you are an advanced user, you can create new output profiles if there is no desired format in the list. Parameters are editable as well. Bit rate, frame rate, resolution etc, can be customized to meet your needs. For example, decrease bit rate to reduce video file size or downscale 4K to 1080P/720P to make video play on an underpowered computer without lagging. 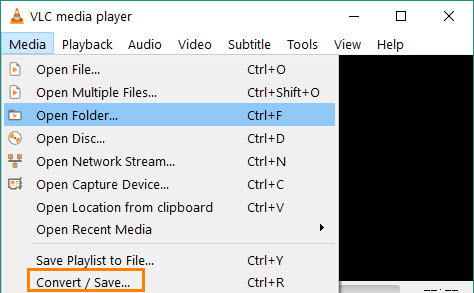 VLC video converter does not show the "Convert" button obviously so that most people haven't learned that VLC is able to convert videos at the beginning. Once you get the "Convert" button in Media menu, you will find it convenient to use this program to change video file format following the wizard navigation. So, how can you use VLC as a free video converter? Follow this ultimate guide to convert video files with VLC. Step 1. Download and install VLC on your computer from its official site: videolan.org. Note: It is a cross-platform program available on Windows, macOS and Linux. Please choose the correct version according to your system. Step 2. Launch VLC video converter and click on Media. Find Convert/Save… and click it. Step 3. Under File tab, there is a File Selection. Click Add button to import a local file or multiple files into the conversion list. After that, click Convert/Save. • If you try to delete one video from the list, select it and click Remove. • You are allowed to use a subtitle file for the video which can be synced after converting. Step 4. Move to Settings panel and get Profile. Click dropdown arrow to select an output profile, for example Video – H.264 + MP3 (MP4). If you try to adjust encoding parameters, click the wrench icon to access to profile edition page. • Under Video Codec tab, you can change encoding parameters including codec, bit rate, frame rate, quality or give custom options. Resolution and aspect ratio can be modified by setting scale and frame rate. • Audio codec, bit rate, channels and sample rate can be altered when you go to Audio Codec tab. Step 5. Now, you need to click Browse button to give a destination folder to save converted file. Step 6. Click Start and VLC video converter will start the conversion work. VLC Video Converter Not Working? How to Fix? It's test time. We try to convert a 4K WebM video to MP4 H.264 with VLC. It seems this program runs very fast. However, there is no message remaindering whether the video is completely converted and just leave the interface. Well, we find the resulting file in the destination folder but it only gives black screen no matter which player we use to play it, including VLC. Our test is a failure. VLC video converter doesn't work properly. Some suggestions tell you to install K-Lite Codec Pack which contains various video/audio codecs to ensure the encoding and decoding process can be successfully finished. But, things can be easier if you get a VLC video converter alternative which is an expert supporting sufficient codecs and offers stable, fast video transocoding performance. WinX HD Video Converter Deluxe – is what we recommend. Built-in hundreds of video/audio codecs, it is available to transcode ANY video (MP4, MKV, AVI, MOV, MTS, FLV, WebM etc.) in a breeze. Profiles for devices, websites, editing software, are prepared for you as well. It takes full advantage of hardware acceleration to utilize Intel, NVIDIA, AMD GPUs to greatly speed up transcoding (especially for 4K/HEVC videos) while retaining high quality. It has an easy-to-navigate interface and you can convert videos in only 3 steps. Add one or more videos > select an output format > RUN. Wrap-up: Compared with VLC video converter, WinX HD Video Converter Deluxe shows simpler, stable way and faster performance to convert videos. Plentiful enough codecs help you to handle any video transcoding without installing K-Lite Codec Pack or other third-party codecs. What's more, it costs low CPU usage so that you can make your computer complete any other tasks smoothly.